A wife, mom of two wonderful boys, blogger, and more especially a faithful servant of the Lord. Not everyone is strong enough to forgive themselves straightaway, even after the people they have done wrong have forgiven them, and even after the God Almighty has forgiven them. Some keep those awful emotions around them like a blanket, covering their entire body and refusing to cease the wailing – to the point of uselessness. If you’re one of those who finds it hard to move on from past mistakes, how are you keeping up with your life then? This is a curious question so please don’t get offended. Everyone messes up, the greatest of all saints have messed up, but I don’t think they have spent the rest of their lives walking down the low road of self-pity, regret, guilt and shame. What I think they did was acknowledged their mistakes, took responsibility for them with appropriate feelings of remorse, made amends, and learned from them so they don’t happen again. What does Gods grace mean to you? Gods grace is deeper than the sea. His grace is bigger than all of the oceans, rivers, and sea put together. No one can compare their grace to Gods grace because Gods grace is far more than just blessings. God shows us favor, kindness, love and mercy. Grace is greater than sin. You can sin your whole entire life but just remember that grace wins every time. Gods grace reaches far beyond the highest star, goes deeper than the deep blue sea. When you feel like there is no hope left, or you feel like a complete failure Gods grace will restore that hope that was lost. Something to ponder on before another work week ends. So what are some ways you can do to help this already chaotic world become a better place? When I was in high school, I had a teacher who asked us to write a letter to our future selves in ten years. Who would we be? Where would be live? Marriage? Family? Career? What would be me most important to us and how would we find space in our lives for the things we claimed to cherish and value? Then, he mailed those letters to us, ten years later. There was significant eye rolling, as you might imagine, when I opened mine. All the hard won wisdom of a sheltered, privileged 18 year old white girl, dreaming her dreams. What would it feel like, now, to write a letter to my younger self, instead? 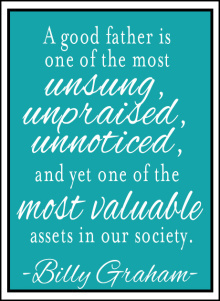 With Father’s Day just right around the corner, why don’t we take the time to ponder on what truly makes a good dad! There are many experts on fatherhood and the best ways to approach the job, but it seems to me that God gives us all the answers we need in His Word. Parenting is mentioned countless times in this book and the requirements are clearly spelled out. Spiritual Leader – A dad should be an example of his family’s spiritual path. It isn’t just a suggestion, it’s an obligation. Proverbs 4 is explicit about a father’s responsibility to instruct his children in the ways of God. Take the time to read it today. Family Authority – Fathers have been relegated to a lower position lately, but according to God’s book, the father is to be the head of the house. This does not mean he should rule his family with an iron fist, but love them above all things and defend them with his very life.